Capri is an idyllic island. Situated off the Sorrentine peninsula in the Campania region – it has long been a playground of the rich and famous – but there is more to Capri than that. It has an intoxicating mix of blue skies, rugged and stunning coastal views, secluded coves and grottos as well as chic cafes and boutiques. It is a worthy addition to any Italian vacation. 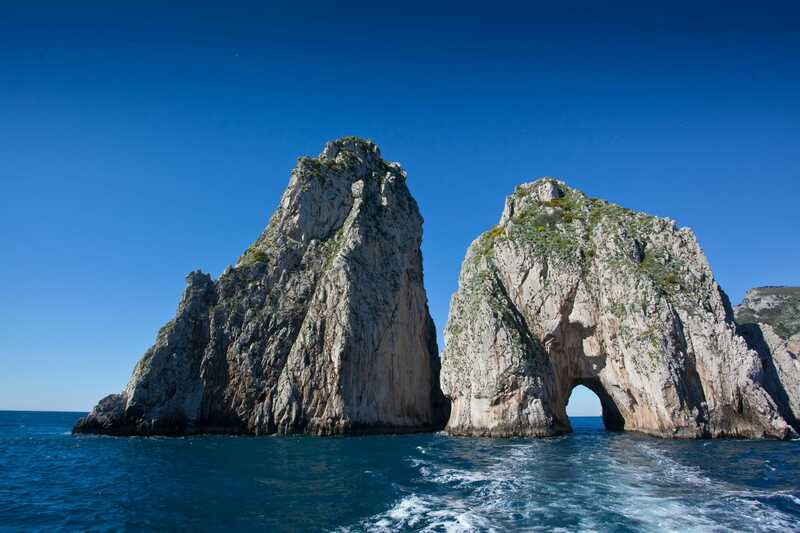 Here’s our Avventure Bellissime guide on how to experience the many wonders of Capri in one day. If you are not planning to stay on the island, then you can visit Capri and experience all it has to offer in one day. If you join Avventure Bellissime’s tour – the first thing you’ll experience is a beautiful boat ride to the island (from Naples or Sorrento) with stunning views of the Bay of Naples as you travel. It is beautiful. Anacapri town is slightly sleepier than Capri and it’s a wonderful place to explore. The journey from Capri to Anacapri is a highlight. If you sit on the right hand side of the bus you’ll be able to take in the awesome view as you climb from Capri to Anacapri. The main square in Anacapri is Piazza Vittoria, which is surrounded by lovely little shops, cafes, restaurants and bars. It’s a perfect place to pause in the sunshine before exploring this side of the island further. Capri is known for its sandals – you’ll find these being sold in a shop on the main street in Anacapri. You can even get a pair custom made to your specifications in just 15 minutes. Fabulous! Anacapri is home to the Church of San Michele. It’s a beautiful building and is regularly described as an architectural treasure and the most stunning church in the Campania region. It sits amongst the quieter streets of Anacapri. It is very modest from the outside, but it’s a different story once inside. The church boasts a stunning hand painted tile floor showing the expulsion of Adam and Eve from the Garden of Eden. If you view it from above near the church’s organ loft, you will get a beautiful view of the masterpiece. From here you will also see the altar and the beautiful painting of Saint Michael – to whom the church is dedicated. One of the best things to do on Capri is to ride up the chair lift to the top of Monte Solaro. From here you’ll get incredible views of the Amalfi Coast and the rest of the island of Capri. It offers the most incredible panoramic view of the area as the summit sits at over 500m above sea level. The chairlift takes around 12-15 minutes to reach the top and you can also walk up (and down) which will likely take you around 1 hour to 1.5 hours. Whilst you are on this side of the island it is definitely worth exploring the Villa San Michele. Built on the ruins of Emperor Tiberius’s villa by a Swedish doctor named Axel Munthe it also offers stunning views of the sea. There’s a beautiful garden with immaculate flowerbeds, a bird sanctuary and roman sculptures and statues. The house even hosts open air concerts on occasion. Faraglioni is one of the iconic images of Capri - three spurs of rock rising out of the sea on the island’s southern coast. They are home to rare plants and animals – one of which is a blue lizard you can’t find anywhere else on the planet. It is the busiest part of the island full of whitewashed buildings and narrow lanes and streets. There are plenty of shopping opportunities – you can find good quality, locally made perfume and linen for sale in Capri. If you spend time at the Piazetta, then you’ll find yourself at the heart of the town. From here you can soak up the atmosphere and perhaps do a little people watching. This is a small, but beautiful garden that should not be missed. The German industrialist Friedrich Alfred Krupp established it in the early twentieth century. The garden has a few levels of terraces that give unrivalled views of sea. Beautiful ornamental plants will surround you as you gaze on the turquoise waters below you. Taking a trip to the blue grotto is high up on the list of things to see in Capri – although it is usually quite busy as it is Capri’s most famous attraction. It is a sea cave that’s illuminated by an unusual blue light. The grotto sunk by 20m during prehistoric times and this blocked every entrance except the current opening. Sunlight enters through an underwater aperture and is refracted through the water – the grotto’s blue light is created by this and enhanced by the reflection of the light off the white sandy sea floor. Another must on the list of ‘what to see in Capri’ is to explore a Roman Villa’s remains. One of the most extensive is Villa Jovis with views over the sea and the mainland. Legend has it that Tiberius had his enemies hurled to their deaths over the cliffs which the villa sits upon. Although overgrown, the site will demonstrate the luxury in which the emperors lived. If you are thinking about taking an Italian vacation, then please do visit our website at tours-italy.com to find out more about our tours of Italy’s main sights like Capri and our Italian vacation packages. Also, if you are looking for some travel inspiration be sure to check out our other blog posts at tours-italy.com/blog/ It’s a great read about all things to do with Italian holidays– like this post about how to visit Capri Italy in one day, following in the footsteps of Romeo & Juliet in Verona, insights into Rome’s Colosseum and the Spanish Steps, how to save money when visiting Italy, the must see sights in Venice as well as why you should consider visiting lesser well known cities like Bologna. It’s a great read about all things Italian and Italian holidays!